Description of decorations: I used 135 kg of dolamite stones for a number of reasons; They have the nearest shape to stones found in Ikola Shore Line. They help to protect fish from getting hurt due to their round edges. The stones are easliy and quickly covered by green and brown algea which is the same type found in Ikola Shore Line. The most important reason for the selection of dolamite stones is the fact that there is no chance of detrimnetal elements dissolving into thewater which are harmful to the fish. As substrate 30 kg of very fine brown-gray silis sand mixed with 20 kg of argonite sand was used. In terms of structure, I used very fine brown-gray sand which resembles the type of sand found in Ikola Shore Line . It also enhances the vivid colors of the fish by the help of its dark color. Th argonite sand aids in maintaining water parameters in degrees equivalent to that of lake Tanganyika. 3 kg of dolamite pebbles are used to make shelters for naturally breed fry. Turqouise coloured background was used to closely replicate the background color of Ikola shore lines of lake Tanganyika. Description of equipment: 6 x Led Fluorescent (13 W,6500 K). 1 x High Output T8 Fluorescent (30 W,2000 Lm). 3 meters led light. 6 x Warmwhite LED Lamps (4,5 W,2800 K, 400 Lm). Filtering System: Selfmade external filtering system including 4 external filters (3500 lt/h approximately). Heaters: 300 W.
Water parameters: Ph: 8,4-8,6, Temp: 25,6°C, 502 µS, GH: 9, KH: 28,5 in, Nitrate: 5-10 ppm and Nitrite: 0 ppm. Description of the area surrounding the biotope: Lake Tanganyika, one of the oldest lake across the world was formed due to tectonic movements in ancient times. In dimensions, it is estimated to be the longest lake in the world with its 660 kms length and second deepest lake by its 1436 meters depth. It’s fed by many small and large rivers so its water is very well circulated and including many elements brougth by rivers. It is a life source for all habitants living around it by providing food and resources. 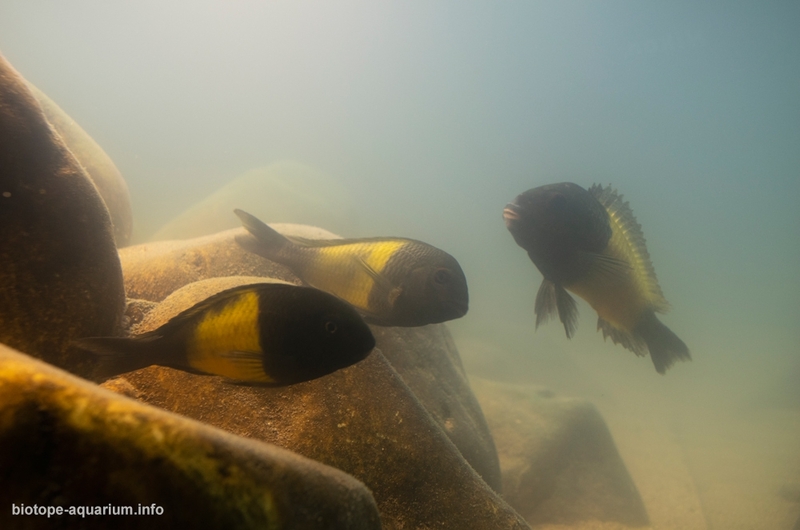 Due to the lake being a great source of livelihoods for humans and other species, the natural habitat is mostly interupted by intruders from land such as birds, hence Lake Tanganyika under water habitants needed to evaluate ways of protecting themselves from such intruders. Ikola region, part of lake Tanganyika situated in Tanzania lies on 6°43’60” S, 30°24’0″ E coordinates. Ikola region consists of mostly sandy and partly rocky beaches, these beaches stretch to thick bushy forests with small trees. In terms of shelter in the forests and hunting in lake for food, this enviroment gives excellent life conditions for it’s habitants especially bird species and humans. As a result, the lands of Ikola region is occupied by many bird species and humans. 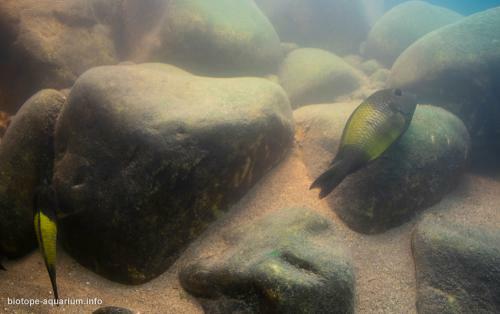 This explain why many of shore residented fish species have mixed colours, mostly with bright coloured bands (yellow, white and red), that is for imitating sunlight reflecting on stones under the water moreover they also choose to feed on bottom and stay away from surface. 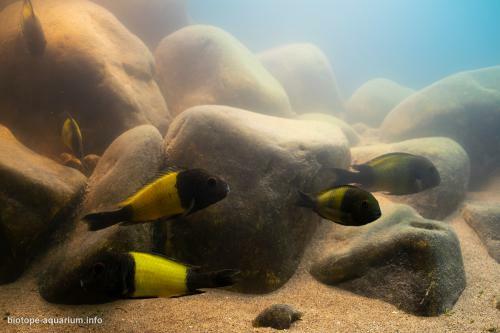 Extension of sandy beaches create shallow rocky and sandy biotopes underwater part of Ikola shoreline. Winds, rivers’ flow and large volume of water create strong waves which cause high erosion in underwater part. Description of the underwater landscape of the biotope: Lake Tanganyika has six main biotope types; rocky shores, the surge, sandy bottom, the muddy bottom, the pelagic waters, the benthic waters. 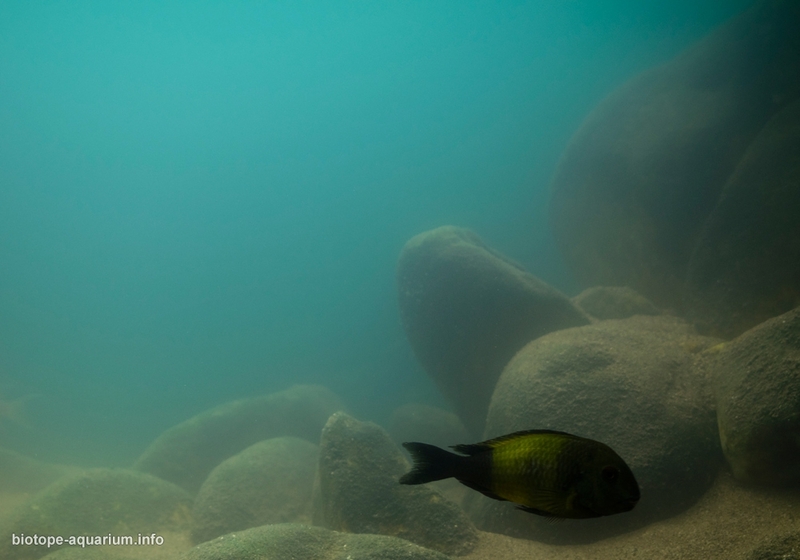 Ikola shorelines in 1-17 meters depth consists type of rocky shore biotopes where stones lies on stones or lies on sand. At 1-3 meters, it consits of stones mostly covered by brown and green algea which are very fundemantal nutriment for heribivores and omnivors. Strong waves and flows bring many nutriment from pelagic and benditc waters such as dead organisms or invertebrates which is valuable for carnivors. The bottom is covered with very fine grayish-brownish sand but partly seen due to densitiy of stones lying on it in shore side. Stones in all sizes creates shelters for species dwelling in the lake. Stones are generally round edged and nearly same color with sand. The upper parts of stones are covered with green algea while the lower parts are covered with brown algea. At 5-12 meters, sediment covers stones more then algea. At these depths caves created by stones on each other and shells with low flow give perfect shelters to substrate spawners. Strong waves and flows make water blurry, oxygen rich and high PH level. Due to low depth, sunlight reaches enough to bottom and support organisms to thrive efficiently. Description of the parameters of the habitat: Temp: 24-28°C, 502 µS, GH: 9, KH: 28,5, pH: 8,5-9,2. 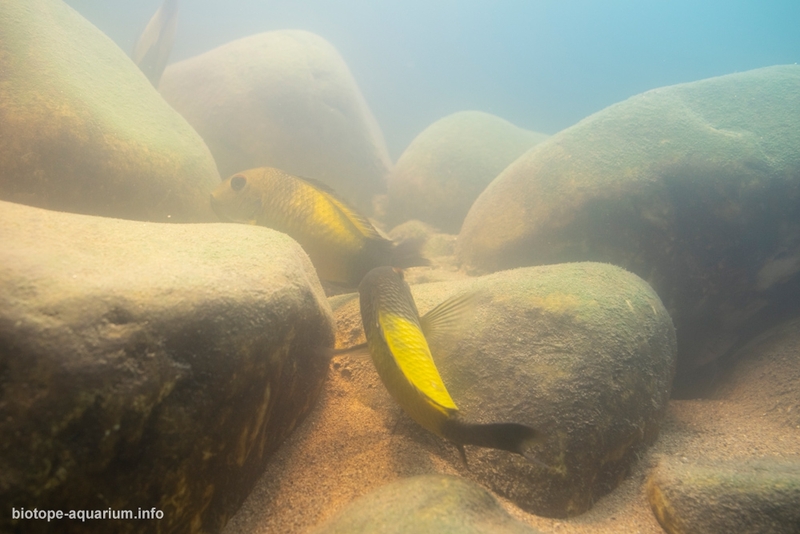 List of fishes and invertebrates occurring in the nature biotope: Altolamprologus compressicep, Altolamprologus fasciatus, Aulonocranus dewindti, Callochromis macrops, Chalinochromis sp. bifrenatus, Ctenochromis horei, Cyathopharynx foae, Cyprichromis leptosoma utinta, Eretmodus marksmithi, Gnathochromis pfefferi, Julidochromis marksmithi, Lepidiolamprologus attenuatus, Limnotilapia dardennii, Neolamprologus callipterus, Neolamprologus calliurus, Neolamprologus caudopunctatus, Neolamprologus cylindricus, Neolamprologus timidus, Neolamprologus lemairii, Neolamprologus modestus, Neolamprologus pulcher, Neolamprologus savoryi, Neolamprologus sexfasciatus, Neolamprologus tetracanthus, Neolamprologus brichardi, Ophthalmotilapia ventralis, Petrochromis ephippium, Simochromis babaulti, Telmatochromis brachygnathus, Variabilichromis moorii, Xenotilapia boulengeri, Asprotilapia leptura, Xenotilapia spilopterus, Tropheus Sp İkola.